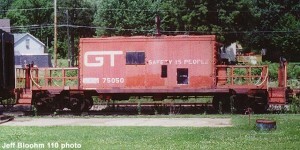 This steel transfer caboose was converted from a boxcar by the GTW’s Port Huron, Michigan shops in 1977. It eventually was obtained by the Association of American Railroads and used at their Chicago test facility. In 1996, it was donated to Mid-Continent along with Alco S-1 diesel locomotive #7 and moved to North Freedom. In 2001 the museum leased the car to the Wisconsin & Southern Railroad Co. (WSOR). It was repainted by WSOR in a yellow scheme and lettered as #X103. It is presently used at their Madison, Wisconsin terminal.